LEN - www.lankaenews.com | President calls P.M. ‘rogue’ ! Pressurizes AG and Bribery Commission to file cases against P.M. and ex finance minister ! President calls P.M. ‘rogue’ ! Pressurizes AG and Bribery Commission to file cases against P.M. and ex finance minister ! (Lanka-e-News -23.Jan.2018, 1155PM) It is a well and widely known fact it is no less a parson than President Maithripala Sirisena who made solemn umpteen promises in public at the last presidential elections that he would be non partisan and impartial after he is elected ,and swore openly that he would abolish the abominable executive presidency within 100 days of his coming to power . It is also an incontrovertible fact , this was the same Maithripala Sirisena who reneged on all those promises after becoming president ,and kicked out the people’s referendum within 48 hours most unashamedly to demonstrate he cannot be trusted even for a tuppence after seizing power. Now , it is the same president prone to villainies and treacheries who has cited the flimsy excuse after dishonoring his promises most shamelessly that he would continue as president until all the rogues ( Including himself ?) are sent to infernal hell thereby demonstrating he is more a ‘joking turncoat ’ and less a president who should be taken seriously. Once again proving his true colors as a most untrustworthy and most opportunistic politician the world has ever known, who would even slit the throats of his sincere friends who propelled him to the present position , at the altar of his most selfish ambitions and power greed , President ‘Sword Sirisena’ alias Sillysena who is by now a byword for ingratitude and double deals had openly exerted pressure on the Bribery Commission Director General and the Attorney General ( AG ) to file cases against P.M. and the former finance minister . 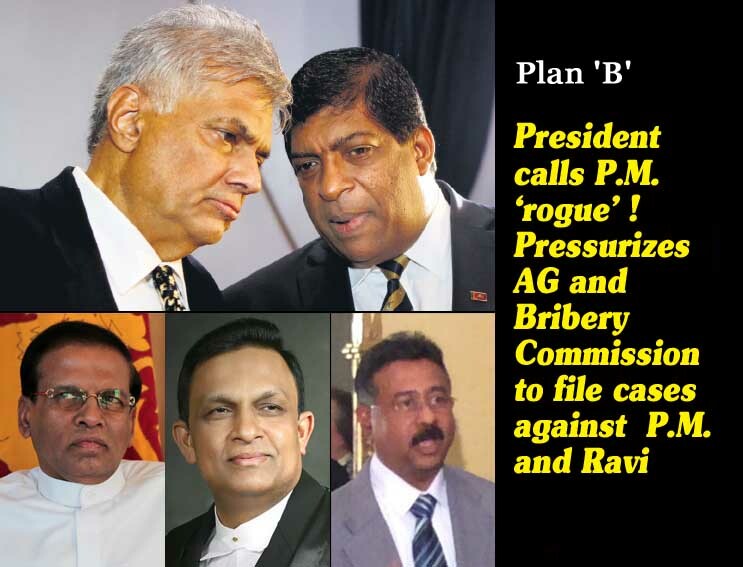 The president gave these instructions when Jayantha Jayasuriya and Bribery Commission Director General had inquired from the president about his ‘plan B’ when president met with a group of lawyers including the AG and the Bribery Commission , Director General Sarath Jayamanne last week. President Sirisena the serpent that gobbled hoppers , and more dangerous than a serpent which gobbles eggs ,had himself told openly based on his own conclusions , that P.M. is a rogue , and laws shall be enforced against him. Sword Sirisena who prefaced his speech by saying ‘ I cannot stab myself and die because the knife is golden’ , had gone on to state , “I came to make this country and go home. The first man who joined with me and signed to make the country has himself ‘screwed’ it up .“ This bond scam was committed with the knowledge of the P.M. ‘ This was done to collect money for the UNP elections. The P.M. cannot escape from that. He is now trapped well and truly. He is skilled in this type of underhand activities . Wasn’t this type of thing done by him in 1988-89 ? You know better about this than I ( addressing Sarath Jayamanne , the BrIbery Commission, DG) , president has told. Weren’t you the one who conducted P.M.’s case ? the president inquired from Jayamanne. Thereafter , Sword Sirisena turned his attention solely and wholly to the Bond Commission report . Based on that cases shall be filed against P.M. and former finance minister Ravi Karunanayake , he insisted. Jayamanne who was not that silly as Sillysena, in a state of shock replied, merely on the report alone cases cannot be filed . However , Jayantha Jayasuriya went on to talk about filing cases. It is noteworthy under the laws in SL , a criminal case can be filed only by the Police. In the circumstances , an investigation must first be done by the CID based on the Bond Commission report before any case is to be filed. It is a pity , even if Sirisena goes raving mad (if he is not already) and persists in his foolish instructions , nowhere in the Bond report is it stated , the P.M. and the ex finance minister are responsible for the Treasury bond lapses. Yet, Sword Sirisena in his characteristic Sillysena style pressurized the AG to file action against them based on the Bond report. When the AG said he would proceed , the president asked him again , ‘ when is that ?’ The AG then promised Sword Sirisena he would take steps to file cases next week or in the first week of February. Accordingly , notices may be issued on P.M. and Ravi Karunanayake. Later, Sirisena when addressing the Elpitiya election rally revealed , he instructed early morning to implement the plan B . The infamous brief-less lawyer Shiral Lakthileke the president’s co ordinating secretary who is always waiting eagerly for an opportunity to fish in troubled waters and bungle everything and undo what is done , along with ‘Athe Kurulla’ in charge of the social media via the internet are giving huge news publicity that Ravi Karunanayake is going to be arrested. Sword Sirisena addressing another election rally on the 22 nd mentioning Ravi Karunanayake’s name and P.M.’s said , when he is taking action against the rogues , his hands shall be strengthened. A reputed political analyst speaking to Lanka e news pointed out , if Sirisena in order to gain cheap political mileage at the forthcoming elections takes UNP leader Ranil into custody before elections , that would without any trace of doubt backfire on him.